Purbeck District Council met on 13th June 2017 and resolved to make (adopt) the Lytchett Matravers Neighbourhood Plan. Therefore, in accordance with the relevant regulations, the Lytchett Matravers Neighbourhood Plan is ‘made’ and shall form part of the Development Plan for the district of Purbeck. More information can be found on the PDC website and you can view the official decision here. 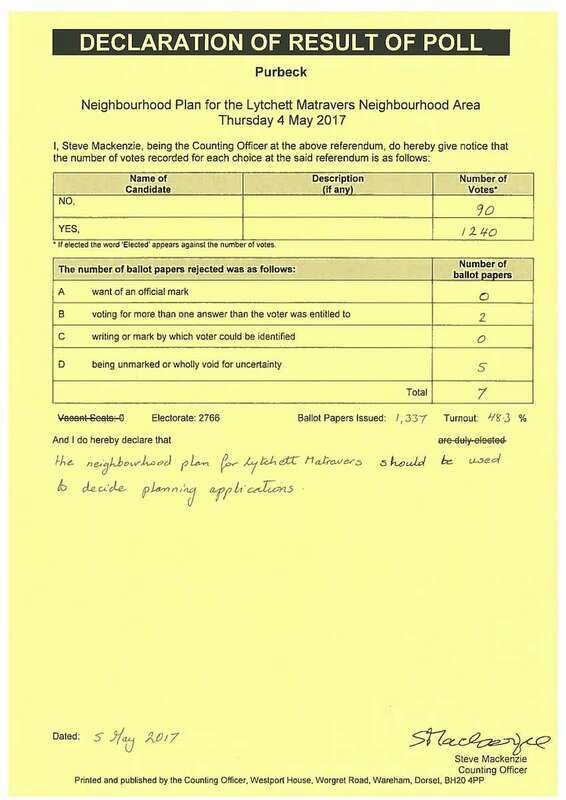 On May 4th the residents of the parish of Lytchett Matravers voted overwhelmingly (1240 yes; 90 no) to adopt the Lytchett Matravers Neighbourhood Plan. This was the culmination of over 3 years work by the planning group and was a very welcome result. It gives the planning team and the Parish Council a firm mandate to have a say in local planning matters, both with Purbeck District Council and with developers. We may be a small player, but we are now a player! Many thanks from all the Neighbourhood Planning Group for all your votes and support. Purbeck District Council have published the notice of the referendum for the Neighbourhood Plan. 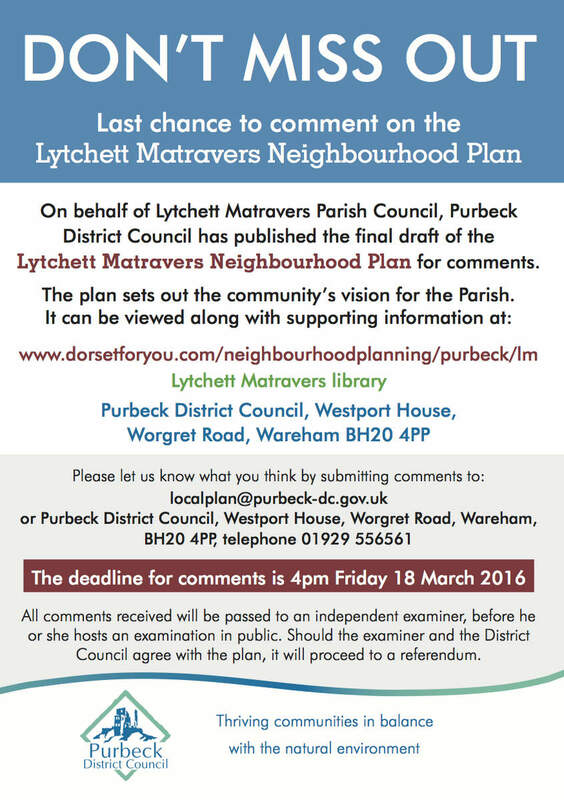 The Lytchett Matravers Neighbourhood Planning Group submitted the plan to Purbeck District Council in December 2015. Since then it has been sent for consultation throughout Purbeck and has now been reviewed by an external examiner. The examiner’s report has now been accepted by Purbeck District Council and the date for the parish referendum set for May 4th, 2017. The referendum is the final stage in the plan evolution and is the opportunity for Lytchett Matravers residents to vote for the plan and to have the plan legally adopted by Purbeck District Council. The Parish Council will be distributing a Lytchett Link nearer the time to remind all and to set out the benefits of having a neighbourhood plan for the village. Those benefits are having a direct say in the type of development in and around the village, ensuring that the published design principles for any development are adhered to and for obtaining the Community Infrastructure contributions from any development to be used to improve and enhance the village for all residents. Purbeck District Council have now published the final draft of the Lytchett Matravers Neighbourhood Plan, for comments. It’s available to be viewed online, at the library or at the Purbeck District Council offices. The deadline for comments is 4pm Friday 18th March 2016. Comments can be submitted via email or by phone or in writing to Purbeck District Council. All comments received will be passed to an independent examiner, before a public examination. Should the examiner and District Council agree with the plan, it will then proceed to a referendum followed by the Council deciding to ‘make’ or ‘refuse to make’ the plan. The Lytchett Matravers Neighbourhood Planning Group has now submitted the Neighbourhood Plan to Purbeck District Council. Following on from the pre-submission consultation in June and July earlier this year, all the responses have been reviewed. The overall response was very positive and the changes to the plan for the Submission version have been very minor. The next stage will be a further analysis and review by Purbeck District Council to ensure they are satisfied and then the plan is published for the Submission Consultation. This will allow everyone to submit any additional comments. You can view the submission version, a review of the comments received on the draft as well as a Basic Condition statement here. We will keep you up to date via our website and mailing list. You will have come across mentions of the CIL (Community Infrastructure Levy) in the Neighbourhood Plan and on this website, so we thought it might be useful to quickly explain a bit more and what role the Neighbourhood Plan has to play. If you want a more detailed description about the CIL and what it is used for, check out the Government’s Planning Portal, but basically it’s a financial contribution paid by developers to cover the cost of improvements to the local area. What this means in practice is that there’s cash made available whenever new houses are built, as the developer has to pay CIL to the District Council Planning Department. Normally the town or village would get 15% of this for local infrastructure projects, but with a Neighbourhood Plan in place the share goes up to 25%, i.e. 66% more! So there’s cash in it for the village and even more cash if we have a Neighbourhood Plan. As well as policies the Neighbourhood Plan sets out a number of Strategic Village Improvements (SVIs). These are not formal prescriptive policies but will be used as a guide as to how any Community Infrastructure Levy and other funding would be used for the benefit of the community. And it’s up to the Parish Council to deliver these objectives over the next 20 or so years. 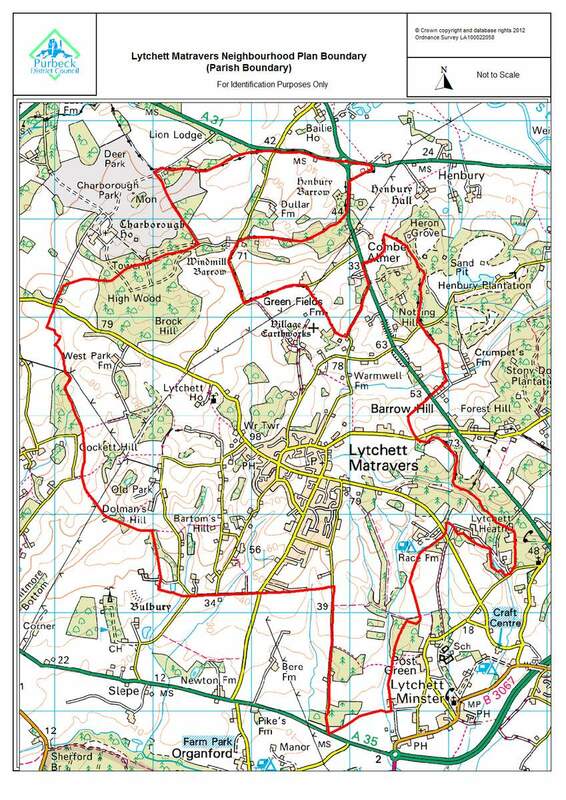 It’s definitely worth taking a look at the SVIs in the Neighbourhood Plan document and give us any feedback or comments you may have for our vision for Lytchett Matravers. If there’s anything there that you feel strongly about make sure you feed it back to the Neighbourhood Plan group before Sunday 19th. Tomorrow’s Neighbourhood Plan session at 10:00 in the library is the last chance residents of Lytchett Matravers will have to discuss the Plan with a member of the Neighbourhood Plan Group. So, if you’ve got something you’d like to feedback or if you’ve got questions about the Plan, make sure you make it to the library Thursday 10:00. And don’t forget the deadline for feedback is this Sunday (19th)! In the meantime, don’t forget you can download the plan right from this website and respond via the website too. We look forward to reading all your responses. Policy 9 – Any proposal for the development of shopping facilities in Lytchett Matravers will be supported, provided there is no adverse impact on the character and amenity of nearby residential areas, the viability and vitality of existing businesses. Proposals which would result in the loss of sites used (or last used) for local shopping facilities (or any other use falling within Part A of the Use Classes Order) will not be supported unless it can be demonstrated there is no reasonable prospect of viable continued use for similar local shopping or community uses, by having been marketed at a reasonable price for at least nine months. What do you think? Make sure you let the Neighbourhood Plan Group know your thoughts – all responses need to be in by 19th!